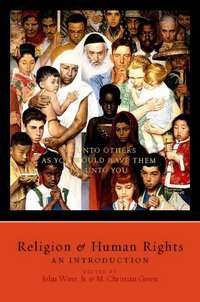 Religion and Human Rights: An Introduction (Oxford University Press, 2012) by CSLR Director John Witte, Jr. and Senior Fellow M. Christian Green has been named an Outstanding Academic Book of 2012 by Choice: Current Reviews for Academic Libraries. Choice is the premier source for reviews of academic books, electronic media, and Internet resources of interest to those in higher education. The book is an anthology of essays by esteemed scholars of law, religion, history, political science and philosophy that explores human rights traditions and modern issues. It is an outcome of CSLR's project on Law, Religion and Human Rights. Every year in the January issue, Choice publishes a list of Outstanding Academic Titles that were reviewed during the previous calendar year. This prestigious list reflects the best in scholarly titles reviewed by Choice and brings with it the extraordinary recognition of the academic library community. The list is quite selective: it contains approximately 10 percent of some 7,000 works reviewed in Choice each year. Choice editors base their selections on the reviewer's evaluation of the work, the editor's knowledge of the field, and the reviewer's record.